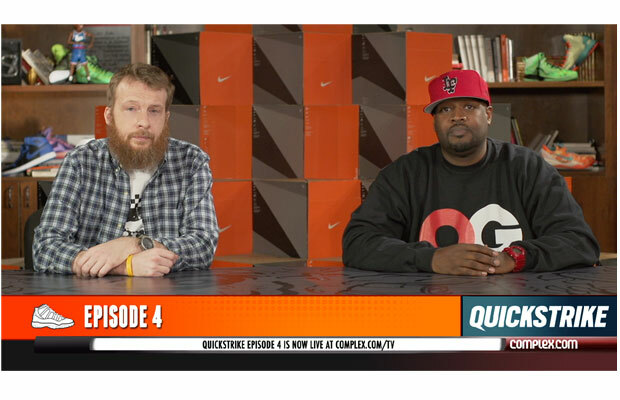 ComplexTV is back with the latest episode of Quickstrike, featuring DJ Clark Kent and Russ Bengtson. In this week’s episode Clark and Russ dive into one of the biggest sneaker stories of 2013 thus far, the NBA All Star sneaker releases. This year’s releases include the Nike LeBron X, Kobe 8, adidas Crazy Light 2 and more. They also touch on some of the New Balance releases arriving at retailers this week and Michael Jordan’s 50th birthday. The show is well done and is a must watch for sneaker fans. With only 4 episodes under their belt, I’m already loving Quickstrike and I’m looking forward to seeing more from Complex TV. You can check out additional episodes of Quickstrike on the show’s homepage and watch the newest one below.